Rep. Steny Hoyer says passing the Senate health care bill is better than nothing if Dems lose their Senate supermajority. Washington (CNN) -- A top House Democrat said Tuesday that the Senate health care bill is "better than nothing," an indication that the House of Representatives is considering passing the more conservative Senate measure with no alterations. The House Democratic leadership may resort to that course of action if Massachusetts Republican state Sen. Scott Brown wins Tuesday's race to fill the vacancy created by the death of Democratic Sen. Ted Kennedy. Brown's victory would deprive Democrats of their 60-seat Senate supermajority and give the GOP enough votes to block future Senate votes on health care and other White House priorities. If the House passes the Senate bill as currently written, however, the measure could proceed straight to President Obama to be signed into law. House Majority Leader Steny Hoyer told reporters he remains "hopeful" that Massachusetts Attorney General Martha Coakley, the Democratic nominee, will defeat Brown. But if she does not, passing the Senate version would be "clearly better than nothing," he said. House Speaker Nancy Pelosi added, "Whatever happens in Massachusetts, we will have quality, affordable health care for all Americans, and it will be soon." Several Democratic congressional sources tell CNN that having the House approve the Senate bill is probably the best of a series of bad options to pass health care reform in the event of a Brown victory. Before Christmas, Pelosi rejected the idea of passing an unamended version of the Senate bill. At the time, she cited several key differences between the Senate and House bills. But Democratic congressional sources now say the White House is privately laying the groundwork for the idea, hoping that enough House Democratic lawmakers may change their minds if confronted with the idea of not passing any bill. A House decision to pass the Senate bill with no changes probably would have to be tied to a promise from the Senate leadership to pass changes favored by the House in the future, sources say. "I would be willing to listen to ways to maybe do a two-bill strategy if that were necessary," Connecticut Democratic Rep. Joe Courtney told CNN in an interview. "I just think there are so many flaws, I think a lot of House members would really struggle to do one vote and walk away with the Senate bill as is." Courtney is a vocal opponent of the Senate bill's tax on high-cost plans, saying it would hit too many working Americans. One senior Democratic source told CNN that one of the many problems with this plan is House Democrats' distrust of the Senate. Courtney said he agrees. "The inter-chamber tension is real. There is just no denying it," he said. "The White House and the president would play a key role in terms of just trying to create a lead-pipe certainty that if there is a multistep process, that they're going to be there to ensure everybody lives up to their end of the deal." Relations between the chambers have become so bad, the source said, that House Democrats may not believe Senate Democrats will follow through on promises to make changes later. Hoyer said it would be possible for both chambers to pass a bill within 15 days after Tuesday's election, which could be the deadline for the Massachusetts secretary of state to certify a Brown victory and thereby allow Brown to be officially seated in the Senate. But Hoyer's office later sent out an e-mail noting that the majority leader "did not say that [the bill] would be passed in that time." Regardless, several Democratic sources have told CNN that option is extremely unlikely because of the political fallout of trying to push something through at a time when voters in Massachusetts may be demonstrating that the health care bill is unpopular at the polls. 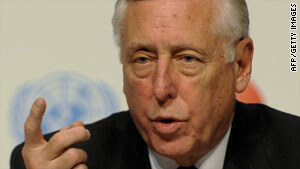 Hoyer said that Democratic leaders are making progress in negotiating a final bill. "Our objective is to get agreement, not to take the Senate bill or the House bill, but to come to an agreement, as is normal legislative process," he said. Hoyer pushed back against the notion that the Massachusetts special election is a harbinger for what Democrats will face in the November midterms. "I don't need the Massachusetts race to tell me the psyche of the American people. I just need to go to the grocery store," he said. "People are angry, people are fearful, people are very concerned about where the economy is." But, Hoyer said, Democrats are responding to the sentiment by focusing on jobs, fiscal responsibility and health care reform.